Drone Art: The Everywhere War as Medium, by Thomas Stubblefield. Published by University of California Press. HEXEN 2039, Multi-venue project across London. Installation: CHELSEA space; Screening: Warburg Institute; Interverventions: Ognisko Polskie, Science Museum, British Museum; Event: Dana Centre and the internet www.hexen2039.net Funded by Arts Council of England. Operation Swanlake, Kunstlerhaus Bethanien, Berlin, Germany. Operation Swanlake, MOP project space, Sydney, Australia. Rosalind Brodsky - Music case history, Briefcase project, Hollywood Hotel + mobile, Sydney. Sightings/Archives from the Institute of Militronics and Advanced Time Interventionality, Digimatter/Grey Matter, Sydney. Odyssey, (an investigation into the lives of Rosalind Brodsky and Pope Alice) Institute of Modern Art, Brisbane. No Other Symptoms - Time Travelling with Rosalind Brodsky, (CD ROM and video installation) Artspace, Sydney. No Other Symptoms - Time Travelling with Rosalind Brodsky, CD ROM - Launch event with performance (involving Richard Grayson, Susan Hiller, Pauline van Mourik Broekman, Elaine Pyke and James Flint) and 'Ghosts of Maresfield Gardens' video installation, Freud Museum, London, England. Dying for your sins, (CD ROM) Australian Centre for Contemporary Art, Melbourne. Time Travelling with Rosalind Brodsky, The Tannery-project space, London, England. Dying for your sins, (CD ROM Installation) Institute of Modern Art, Brisbane. Kitsch'n Shrink, Greenaway Gallery, Adelaide. Q.Would you recognise a Virtual Paradise?, Mizuma Art Gallery, Tokyo. Q.Would you recognise a Virtual Paradise?and other paintings, Contemporary Art Centre of South Australia. Q.Would you recognise a Virtual Paradise?, Australian Centre for Contemporary Art, Melbourne. Q.Would you recognise a Virtual Paradise?, Exeter Hotel, Adelaide. Recorded Evidence:Prosthetic Speech, [RE] Gallery, Adelaide. Between the Clues lies the Evidence, PostWest, Adelaide. Don't Call it Performance, Centro Andaluz de Arte Contempor‡neo,Seville, Spain; Domus Artium 2002 (DA2) Salamanca, Spain; El Museo del Barrio, New York, USA. ICOLS, in Collectivity and critical collective/cooperative cultural action, Oliver Gallery, University of South Florida, Tampa FL USA. ICOLS in Connect the Dots, The LeRoy Neiman Gallery, Columbia University, New York, USA. Metis:Time/Beam me up, ANU School of Art Gallery, Canberra, Australia. Fly Utopia!, transmediale.04, Haus der Kulturen der Welt, Berlin, Germany. ICOLS How to be a perfect guest, Sharjah International Biennial 6, Sharjah Art Museums and Expo Centre Sharjah, United Arab Emirates. ICOLS, The Esplanade, Theatres on the Bay, Singapore. ICOLS in Art meets Archive, Sydney State Records Centre, Sydney, Australia. LE NUMERIQUE : nouveau médium de l'art- From 01.10.01 to 01.11.01, Galerie de Pret d'oevres d'Art, Bruxelles, Belgium. New Releases (video), 4a Gallery, Sydney and tour. Chip, Melbourne International Film Festival. Technoscience, Hybrid Workspace, Documenta X, Kassel, Germany. Wardrobe, Madlove Gallery, Adelaide and tour ('98). Artists' Week : Compost Telstra Adelaide Festival '96. It's a Pleasure, Royal Festival Hall, London. Street Gallery, Mishima Ave shopping arcade festival, Sizuoka, Japan. New Voices - Jeunes Artistes Britanniques, Musee National d'Histoire et d'Art a Luxembourg; Centre d'Art Santa Monica Barcelona; Museo de Bellas Artes Bilbao; Centro Culturel Galileo Madrid; Sala de Veronicas, Murcia; Pescadera Viega Sala de Arte, Jerez; Kulturhistorisches Museum, Magdeborg, Germany. 20th Century Women's Art, New Hall College, University of Cambridge. Scene of the Crime? A Presumed Innocent collaborative installation, Post West, Adelaide. A Painting Exhibition in Two Parts, Todd Gallery, London. XXI Festival International de la Peinture, Cagnes sur Mer , France. John Moores, Walker Art gallery, Liverpool (3rd prize). New Brits: Contemporary British and Scottish Painting, The Contemporary Arts Center, Cincinnati, Ohio, and tour of USA Museums. Object and Image: British Art in the 1980's, City Museum and Art Gallery Stoke on Trent. Figuring out the '80's, Laing Art Gallery, Newcastle upon Tyne. Something solid, Cornerhouse Galley, Manchester. 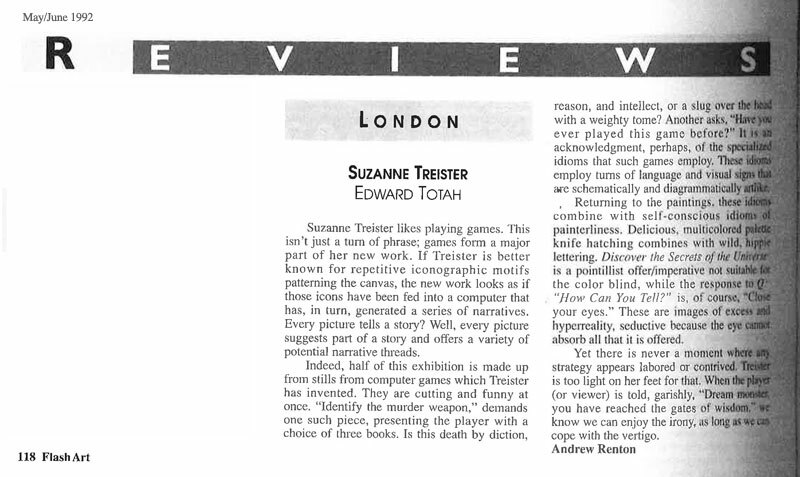 4 London Artists, Nancy Hoffman Gallery, New York. It's a still-life, Arts Council Collection, South Bank Centre, London and Tour. The Golden Thread? Classical Mythology in Contemporary Art, Harris Museum and Art Gallery, Preston, Milton Keynes Exhibition Gallery, Royal Albert Memorial Museum, Exeter, Bradford Art galleries and Museums, Bradford. 1986-87. Love, Sacred and Profane, Plymouth Arts Centre and Stoke Museum. Camden Annual, Camden Arts Centre, London. 4 British Artists, Edward Bates Gallery, Chicago, USA. Nature Morte, Edward Totah Gallery, London. Open Exhibition, Riverside Studios, London. Stowells Trophy, Royal Academy, London. Charlotte Laubard, Francine Fort, Yann Chateigné Tytelman, Emilie Renard and others, 'Insiders', exhibition catalogue, CAPC, Musée d'Art Contemporain de Bordeaux, France. Pub. Les presses du réel, France, 2010. Artist pages ('Rosalind Brodsky' project) - Arkzin (Zagreb) No 4 (100/101) 12.'97./01.'98. Interview with Mutual Reality http:/www.widemedia.com/mutual/ re. ICA/Toshiba comm. 1983-1996 Visiting lecturer at St Martins School of Art; Chelsea School of Art; Trent Polytechnic, Nottingham; Bath School of Art; Coventry Polytechnic; Royal College of Art, London; Goldsmith's College, London; Kingston Polytechnic, Central St Martins, London; Camberwell School of Art, London; Ruskin Oxford; Glasgow School of Art; Monash University, Melbourne; University of Leeds; Sydney College of the Arts, Australia; University of South Australia; Onkaparinga TAFE, South Australia. 1999-2000 Reading University; Wimbledon School of Art, London; University of Northumbria, Newcastle upon-Tyne; Goldsmith's College, London; University of Western Sydney-Nepean; Sydney College of the Arts. 2001 University of Newcastle upon Tyne, UK; University of Newcastle, Australia. 2002 UTS Sydney; University of Newcastle, Australia; University of Westminster, UK. 2003 Brighton University, UK; Wimbledon School of Art, London. 2004 Universitat der Künste, Fakultat Bildende Kunst, Institut für Kunst im Kontext, Berlin. 2007 University of Northumbria, Newcastle upon Tyne, UK. 2007 Berkeley University of California; Pomona College, Claremont, Los Angeles; New York University (NYU), USA. 2007 University of Gwent, Wales; University of Derby, UK. 2008 Wimbledon School of Art, London; University of Brighton, UK; University of Westminster, UK; Kunsthochschule für Medien Köln, Germany. 2013 Goldsmith's College, London; Central St Martins, London. 1999 National Digital Art Prize, Australia, 3rd prize. 1998 Australia Council, New Media Fund. 1998 Australian Film Commission, multimedia completion funding. 1997 Australia Council, New York studio residency (for 98/9). 1996 South Australian Department of Arts and Cultural Development. New Work grant. 1995 Australia Council, professional development grant. 1994 British Council, travel grant. Tokyo. 1994 South Australian Department of Arts and Cultural Development. New Work grant. 1992 British Council, travel grant, Australia. 1989 John Moores, Liverpool, 3rd prize. 2000 'Doing it digitally: Rosalind Brodsky and the art of the virtual female subject', Next 1.0: New Extensions of Existing Technologies, Karlstad University, Sweden. Paper presented by Jyanni Steffensen. 'Doing it digitally: Rosalind Brodsky and the art of the virtual female subject' Verve at Artist's week, Telstra Adelaide Festival 2000, Ngapartji CMC. Paper presented by Jyanni Steffensen. 1999 Brodsky, Economics and the Jewish Science or How to Finance Time Travel from the Production of Virtual Vibrators, Exploring Cybersociety, School of Social, Political and Economic Sciences, University of Northumbria, Newcastle, UK. Paper presented by Jyanni Steffensen. Invading Ancestral Spaces through the Privileged Violence of Technology, futureScreen 99: AvAtArs | phantom agents dLux media arts at the Powerhouse Museum, Sydney. Paper presented by Jyanni Steffensen. 1994 Still Photography? International symposium on the transition from analog to digital imaging. University of Melbourne. Paper presented by myself. 1997 Wardrobe, Madlove Gallery, Adelaide; The Performance Space, Sydney; I.M.A. Brisbane; P.I.C.A. Perth. 1996 White Hysteria, Contemporary Art Centre of South Australia; Stripp, Melbourne.